Meld-ing the best of modern technology with classical lines and elements so evocative of the French Riviera’s ‘joie de vivre’ in the 1950’s and 60’s, the Rivamare elegantly transports one not only over the sparkling ocean, but also through time. Finished in a shimmering metallic London Grey livery, the Rivamare’s mirror-reflective high-quality stain-less steel fittings that adorn the craft are sculpted art forms in themselves, expressing a perfectly balanced approach to form and function. From the anchor in the bow flanked by traditional Riva mooring lights, through the flagstaff on the coachroof and right back through the grillework and aft cleats, each piece of brightwork is fashioned like a jewel to subtly enhance and contribute to the overall design. The fold-down transom plate allows easy access from the dock when berthed stern-to and, when lowered at anchor, creates a wonderful bathing platform. 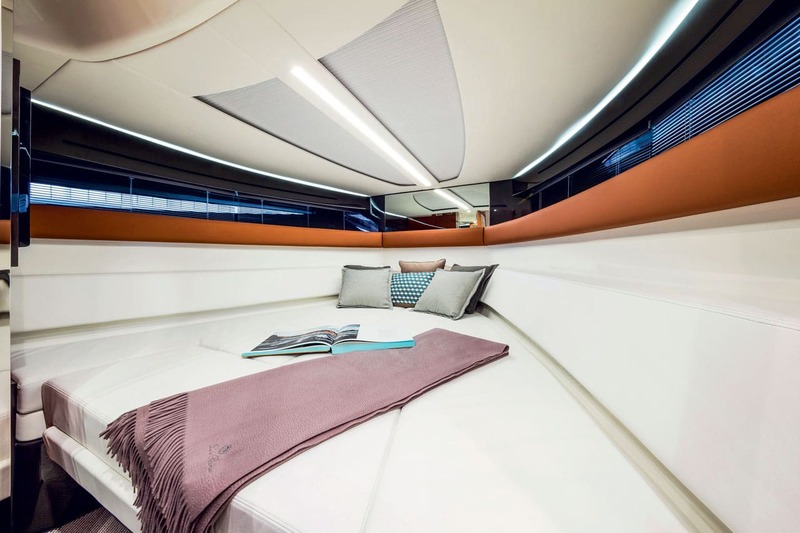 This ingenious inclusion is the first hint of the numerous cleverly-conceived features of the Rivamare, as it not only allows guests to slip in and out of the sea with consummate grace–as being a Riva user demands–but also reveals two sunpads for recline and repose at water level. Delicate embellishments, like the sunpad’s strap and buckle fasteners, are reminiscent of the golden age of travel; refined reminders of this retro-modern masterpiece’s heritage and time traveler persona. Nestling into the C-shaped aft sofa as the lines were cast off, we took a moment to appreciate the perfection of the laser-straight stitching, the exacting precision of the joinery, the tactile glow of the mahogany’s glossy finish and invisible welds of metal components… all indicators that the brand’s reputation for craftsmanship is being staunchly maintained. The bi-leaf mahogany dinette, which folds into a cocktail table to allow easier movement around the cockpit, reveals a grab handle that proves to be useful as we clear the marina and the throttles are pushed forward. Stepping up to the console that separates the guest seating from the helm station, we found a washbasin, Corian cutting board for preparing canapés, dedicated glassware storage, an ice dis-penser, large refrigerated draw for refreshments and two useful waste receptacles. Bracing ourselves against the surge of acceleration delivered by the twin 400hp Volvo Penta D6 DPH engines hooked up to stern drive propulsion units, the Rivamare proves to be not just pretty, but a serious performer too! We recorded a commendable top speed just below 40-knots (with tanks almost full), before notching back to 3,000rpm and a cruising speed of 30-knots that burns around 117 L/h. While the Rivamare’s performance in terms of speed and sports car-esque tracking through turns is commendable, the most impressive characteristic of the yacht’s sea-keeping ability is the sympathetic nature of her naval architecture. In all honestly I cannot recall driving a boat with a softer ride, a more comfortable and for-giving hull. In the cockpit, ensconced behind the five-piece double curved crystal windshield that is a conversation piece in itself, it is only the curtains of spray she throws out laterally that indicate there was even a bump in the road. An integrated control system, including a joystick and docking mode function, makes close quarter handling a synch and provides the ability to ‘walk’ the boat sideways into even the tightest of berths. 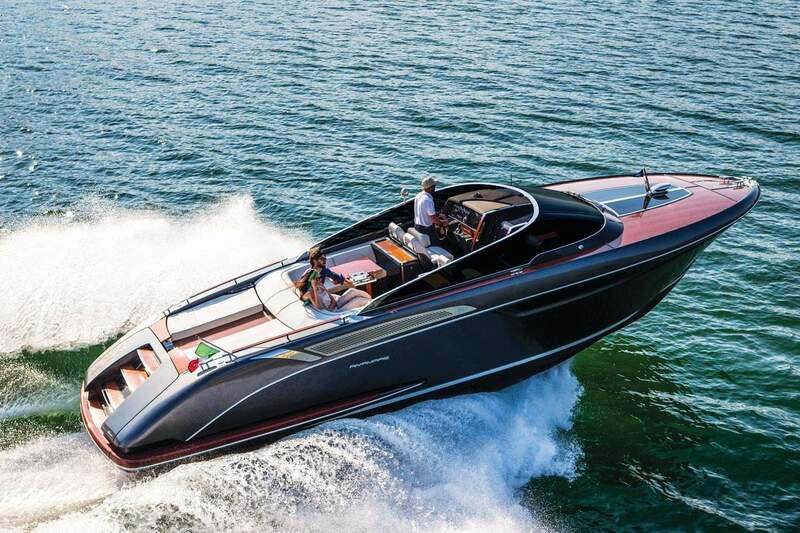 At higher speeds, when accelerating an executing turns, a sophisticated auto-trim function takes inputs from the throttles and steering wheel and converts them into outputs for the stern drives and interceptors to ensure the helm always looks like a pro. For guest comfort Riva have pioneered the installation of a Seakeeper NG5 gyro-scopic stabilizer, offering rock solid stability while at anchor for the first time in a craft of this size. Having fully enjoyed the extensive facilities available to guests in the exterior entertainment spaces, when cruising back to the marina we descended the companionway to the starboard side of the helm to investigate the Rivamare’s internal space. At the bottom of the companionway–which folds out of the way to create extra space–one finds a luxurious day head and full-height shower cubicle to port, while the open galley is sufficiently equipped to make both day cruising and weekending both gastronomically satisfying and practical. Skylights in both the galley and head create welcome air circulation, though a full air conditioning system is also an option. The forward section of the lower deck is dedicated to a sociable banquette and dinette arrangement molded into the forepeak. Every available space has been employed for stowage, a TV can be mounted on the bulkhead, and for those impromptu romantic occasions a neat little champagne/wine chiller can also be installed. But while the craft’s aesthetic appeal is obvious from the very outset, it is the less visible elements that really provide her depth of character. The soft-ride hull, the sophistication of the intuitive helming systems, the precision craftsmanship of the high quality construction, fit and finish extending to even hidden storage, the painted rather than gel-coat exterior finish, the aft stowage compartment for a SeaBob, the concealed electro-hydraulic bimini and so much more. There are so many reasons to fall in love with the Rivamare… her appeal is timeless.